In Content Studio it is possible to dump a site to .DAT - files that can be used when installing a new Content Studio site. This makes it possible for a developer to build the customer's site on a development machine and install it via the Content Studio installation program. Site dumps can also be used as backup and has the advantage over regular SQL-server database backups in that that they are far more easy to restore on a new server. They are of course not a replacement for daily backups particulary not for sites with a lot of security set. The Site Exporter does not export any user or group information and no security information. To create a site dump you log on to the Content Studio server and you must have access to the SQL-server installation that drives the Content Studio site to be dumped. Before running the site dump you must know the name of the SQL-server database that contains the site to dump. Run the Site Exporter utility that can be found as a shortcut on the Content Studio folder on the program menu. 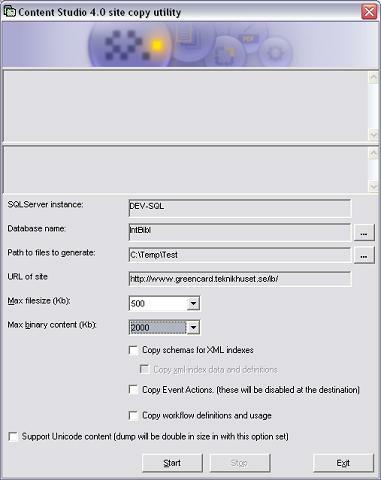 This utility starts by asking you for the name of the SQL-server instance and the database that contains the site. In the main window you need to select a folder in the file system where the DAT-files need to be located. Before running the dump you might need to set some options that affect perfomance and content of your dump. Max file size: This option sets the maximum size that each of the dumped files can have. Setting this value to a low value will create more but smaller installer files and can increase performance when the files are used to install the site. Max binary content: This value limits the size of the binary content in uploaded files that are dumped. If a very large document ex. a video exists on your site that has a content size that exceeds this limit the document will be dumped but its content will be empty. After installation you can manually upload this file again. This is mainly for performance and deployment reasons since both the dump and the installation of that document can take a very long time if the content is very large (> 5 Mb). Currently this size is limited to 20 Mb. Copy schemas for XML indexes: If this option is selected the XML schemas that is stored with each Edit Template is copied. Normally if your site is based on the EPT technology you should always select this option. Copy xml-index data and definitions: This option will dumpt the content of the entire Content Studio XML index. A large site with a large amount of XML indexed documents can create a vast amount of indexed data that can increase the time of the dumping process and the installation time. Normally if your site is based on the EPT technology you should always set this option. Copy Event Actions: Copies the Event Actions that has been defined on your site. For security reasons these will be disabled at the destination. After installation an administrator must manually enable every Event Action that has been defined. Copy workflow definitions and usage: Workflow definitions are not always compatible with the the new location of the site and in these cases it can be more convenient to leave this option unchecked. Support Unicode content: This option allows you to preserve documents that have Unicode content ex. Chineese or Korean. Since the site dump will be stored as Unicode the .DAT-files will be double in size and this will also effect performance of the installation. Thus, you should only set this option if your site contains Unicode data. Documents Always, except for system documents. Unicode format is optional.